The beautiful art is by Roy Kinzer. Now, I first met Nick a number of years ago as a member of Gordon Au’s Grand Street Stompers, Emily Asher’s Garden Party, and other groups. I knew, when I came in the door and saw Nick that there were going to be engaging — sometimes surprising — melodies created, that the rhythm would be bountiful and imaginative. I could relax and anticipate great things. 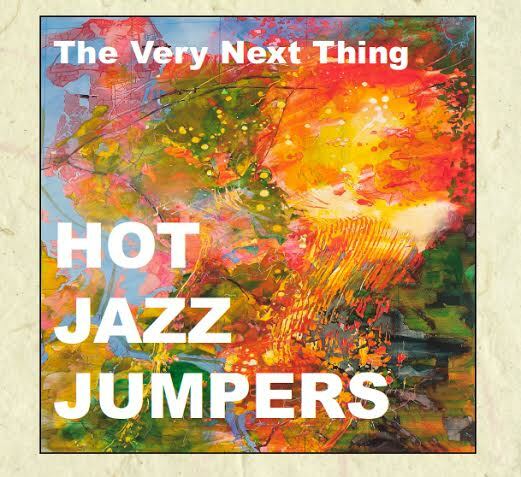 But I’d never heard Nick’s Hot Jazz Jumpers until now, when they are celebrating the pre-release of their new CD/DVD, and they make fine unfettered spacious music. Most compact discs by one musical organization that come my way — and this is not surprising — offer similar musical experiences all the way through, sometimes seventy-five minutes’ worth. And for many listeners, this is consoling, rather like buying a chunk of Manchego at the cheese counter. But the HJJ (if I may be so informal) are too large, energetic, and unruly to be confined to one stylistic box. So the new disc — with seventeen performances — offers the beautifully idiomatic “traditional jazz” of WHEN THE RED, RED ROBIN COMES BOB, BOB, BOBBIN’ ALONG featuring trusted New York swing stars Gordon Au and Dennis Lichtman among others . . . three tracks later, one hears a free improvisation for Nick, guitar, and Miles Griffith, voice. The range of repertoire is delightful broad, brave, and the results are compelling: CARAVAN, YOU ARE MY SUNSHINE, NOBODY BUT MY BABY IS GETTING MY LOVE (when was the last time you heard that Clarence Williams song performed? ), IN A MELLOTONE, SWEET GEORGIA BROWN, MANHA DE CARNAVAL, AIN’T MISBEHAVIN’, I’VE GOT MY MOJO WORKING, and THIS LITTLE LIGHT OF MINE. Then there are originals and less familiar numbers: two versions of the New Orleans JOCK-A-MO, the bluegrass FREIGHT TRAIN, JAM FOR LENNY, DIRTY40. Listening to the CD, I was delighted by its expansive conceptions: the Hot Jazz Jumpers offered what their name promised, but I also heard more contemporary New Orleans music, echoes of Motown, of classic rhythm ‘n’ blues, and less familiar forms that I learned were Gullah Geechee rhythms, North Indian classical music, and world music. I heard subtle and bold percussion and rhythms, and two powerful voices: Bettina Hershey’s, vibrant, folk-inflected, eloquent, and the quite remarkable Miles Griffith, who — singing or scatting — roams freely in his own universe, whose monarchs are Leo Watson and Leon Thomas. On the CD, you’ll hear Nick, guitar, tenor banjo, resonator, baritone resonator; Bettina Hershey, voice, guitar; Miles Griffith, voice / scats; David Pleasant, drums, harmonica, voice; Essiet Essiet, bass; Mamadou Ba, bass; Gordon Au. trumpet; Josh Holcomb, trombone; Dennis Lichtman, clarinet; Mike Russo, guitar. The accompanying DVD has Eleven more songs, including video presentations of CARAVAN (with a delightful impromptu beginning), INDIANA, NOBODY BUT MY BABY, RED RED ROBIN, FIVE FOOT TWO, and some other surprises. Now, I hope I’ve enticed the bold and tantalized the lively. The best way to experience Nick Russo’s music is in person, although the two videos give strong evidence. On Friday, July 24, 2015, you can hear and see the Nick Russo Trio featuring: Nick Russo, guitar/banjo; Nathan Peck, string bass; Harvey Wirht, drums; with special guests Miles Griffith & Betina Hershey — at Bar Next Door (http://lalanternacaffe.com/) 129 MacDougal St, New York, NY 10012 (212) 529-5945 — three sets, at 7:30, 9:30, and 11:30. Here is the Facebook event page. Doors 10:30pm // Showtime 11pm: Miles Griffith, voice/scats; Betina Hershey, voice/guitar; Nick Russo, guitar/banjo/voice; David Pleasant, drums/harmonica/voice. Here is the Facebook event page for the 25th. Want to know more? Here is the band’s website. Nick is so versatile that he has two Facebook pages: here and here. And for those who might be visiting Massachusetts in August, the HJJ have a mini-concert tour there in Woods Hole, August 3 – 5: DVD/CD pre-release concerts at Quicks Hole Tavern in Woods Hole, 29 Railroad Ave, Woods Hole, MA 02543. Each concert goes from 9-11:30. Details here. At any of these concerts or gigs, I know you will hear honest, lively, stirring music. 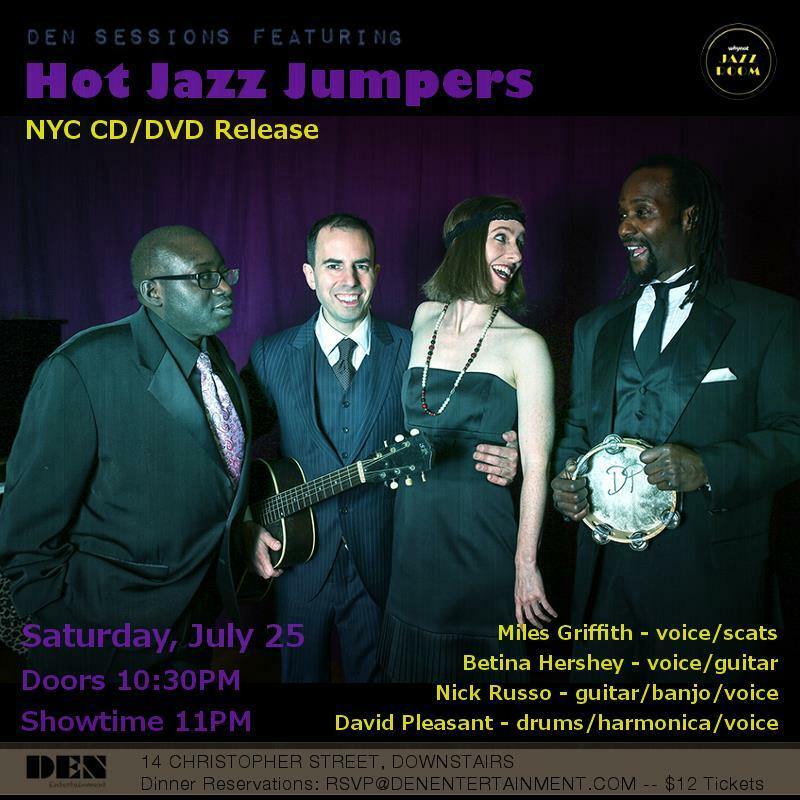 And purchasing the CD/DVD will enable you to take the Hot Jazz Jumpers home with you as well. They’ve assured me they won’t mind. This entry was posted in "Thanks A Million", Bliss!, Generosities, It's All True, Pay Attention!, Swing You Cats!, The Real Thing, Wow! and tagged Bar Next Door, Bettina Hershey, bluegrass, David Pleasant, Dennis Lichtman, Emily Asher's Garden Party, Essiet Essiet, Gordon Au, Gordon Au's Grand Street Stompers, Harvey Wirht, Hot Jazz Jumpers, Indian classical music, Jazz Lives, Josh Holcomb, Leo Watson, Leon Thomas, Lynn Redmille, Mamadou Ba, Michael Steinman, Mike Russo, Miles Griffith, Motown, Nathan Peck, Nick Russo, Roy Kinzer, world music. Bookmark the permalink. “Hot Jazz”? Yes. But in many ways this group of very individually different individuals is bringing back a fun, playful excitement not experienced much since the days of ” Jass”. Having said that, it is a true craft how they incorporate and perform different genres to be enjoyed like opening shiny, bright packages on Christmas morning. Thank you so much for introducing me to the talent of “Hot Jazz Jumpers”!